The pound is not what it was in global terms. Over the centuries the major dominant currencies have changed. Going back a millennium the different currencies of different states circulated widely, well beyond their own borders. Several currency exchanges existed in Europe to determine the relevant value of one coin to another for those trading across borders. The value was based on the metal the coin was made from – gold, silver or copper. Coins were widely circulated and valued by both reputation of the mint and the identified metal value. As paper money became more convenient it was vital the issuing bank could back their notes with actual gold or silver, not that was always the case. The heyday for sterling was the nineteenth century when Britain was a global trading nation. England originally pegged the pound to an ounce of silver, way back in 775, hence the term sterling. In 1717, ten years after the union, sterling’s value was based on gold at £4.25 (4 pounds 5 shillings 0 pence) per fine ounce. During the late nineteenth century more countries adopted a form of the gold standard. Britain was the major global trading nation absorbing more that 30 percent of global exports by 1860, much of it in the form of raw materials then transformed into product for home consumption and export. Sterling was the currency many raw materials were priced in and London became a financial centre where foreign buyers would maintain a deposit account and other countries held sterling bonds as part of their currency reserves. Within 20 years the UK was in decline in terms of share of global trade. London remained a key financial centre. The Empire remained a source of foodstuffs and raw materials. Competition from other European nations building industrial capacity and recovery in the US economy after a disastrous civil war, that had claimed an estimated 620,000 to 750,000 Union and Confederate combatant lives, meant Britain’s share of global trade was in decline. With more competition for Britain’s dominance of global trade, was this something to worry about? Britain straddled the waves and the factories churned out black smoke and goods for a growing population and for export. The growth of Britain’s trade with the rest of the world meant increasing prosperity yet overshadowed a real term decline in its market share. Just as Britain had taken over from Holland, the leading international commercial and financial power in the 17th and 18th centuries, a change was underway that would take several decades to identify the countries that had overtaken Britain as the new major industrial and commercial producers. For the next 100 years Britain attempted to rebuild its production economy. By the time Harold Wilson was PM, imports and exports were more or less in balance. Sterling dropped to $2.40 following the last attempt at a strategic devaluation to promote exports. The Tories screamed blue murder at Wilson but sterling continued its decline under Thatcher and Major. It actually perked up slightly in the Blair years. Brown and the 2008 crash saw sterling resume its market led devaluation. The pound crashed on the Brexit vote result. 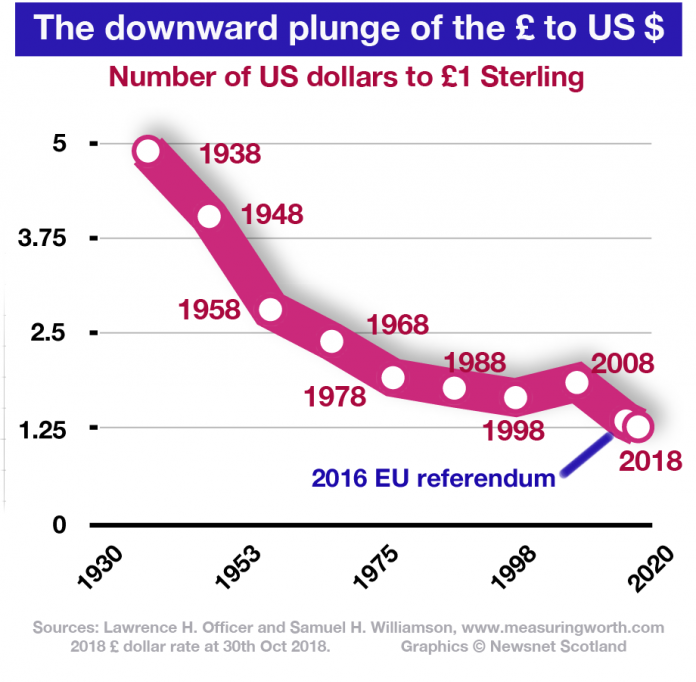 In the years before the WW2, £1 sterling still bought $5 US but the downward trend became inevitable as America became the dominant global economy with metals and resources priced increasingly in dollars. The Empire had gone and the more advanced Commonwealth countries were building their own trading relationships with less dependence on Britain. This was an inevitable process but the continuing decline was greater than it need have been through a failure to identify the new industries of the future in a timeous manner. The UK joined the European Economic Community in 1973, recognising that trading relationships were strongest in global regions and time past for any reality of a major global footprint. To this day some continue to believe it is reclaimable with talk of ‘Global Britain’ rising to fever pitch under Prime Minister May. In actual fact the dominance of intra Western European trade has a two hundred year history. The European Union was built on two centuries of trade with periods of negative impacts during WW1 and a major decline starting in the 1930s until 1945. Growth resumed after the war and intra Western European trade in exports to GDP ratios, accounted for over half of all Western European exports. Western European exports to Eastern Europe, as a percentage of GDP, was the next largest contributor with the US well behind in 3rd place. 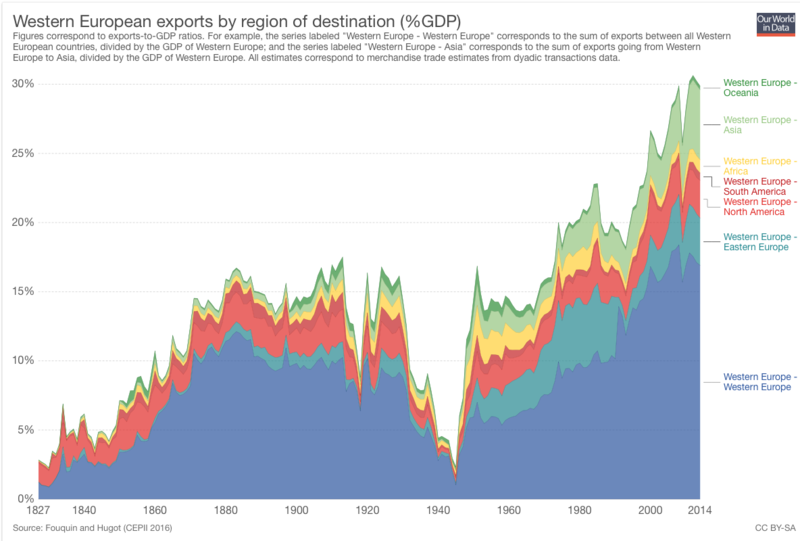 It also clearly shows the impact of the two world wars on the European economy. The war to end all wars did not. The depression and World War 2 wrought massive economic, social and political destruction. Today we have the European Union built on a determination to shape a peaceful prosperous future. The UK, as represented by England, decided to leave in 2016. As an outcome to tortuous negotiations reach still unknown political and economic consequences it has been clear the 27 standing together for the interests of the EU have held all the cards. Our European neighbours have their interests to protect because the EU is the largest global trading block. Scotland dragged out of Europe against our will means we face being tied to the declining fortunes of England unless we stand firm. We have seen how Ireland as a member state has had the backing of the 26 other members to prevent a hard border between NI and the Republic. Spain has gained by forcing May to begin a process that means Gibraltar gets a special deal and will almost certainly eventually return to Spain. A weakened England will have to concede on rights of historical access to UK waters. Scotland has to look after its own interests and that can only be achieved through independence. May has wasted almost two years trying to unite her party. It was an impossible task and remains so as a damaging economic, political and social conclusion is set to create havoc because England cannot agree with itself. Since 2016 sterling has fallen further from the impact on the night of 23rd June 2016. Capital Economics estimate a further drop to between $1.12 and $1.20 is on the cards. Moreover businesses have been making plans to protect their business within the EU. Irreversible decisions have been made that will add further losses to UK trade and employment. In the absence of any clear indication of negotiations reaching a positive outcome, businesses were forced to plan for No Deal. Between 1990 and 2007 the old developed OECD countries lost % share of World Goods Exports to newer rising stars. Turkey, Korea Republic and Mexico saw gains. Within the EU; Spain and Ireland gained, but the big winners were the former Eastern European block countries; Poland, Czech Republic, Hungary and Slovak Republic. The largest losers were the UK and Japan. May will try to sell the agreement with the EU as some sort of victory. It is only a potential arrangement for a transition period. A deal comes much later following years of negotiations and we know how Westminster fails to sit down and get on with negotiations and how weak the UK’s hand is as a leaving state. The EU does want a deal, no matter how exasperated they are with the last 18 months. England expected, as England does, that the EU would fold on the four freedoms that are the cornerstone, building blocks and walls of real frictionless trade. The more England tried to divide the 27 by attempting to gain their support the more they stuck together and backed Michel Barnier as their lead negotiator. Now England needs to decide what it wants and there is no sense of any political cohesion in either the Conservative or Labour parties. The SNP, with the majority of Scottish Westminster seats, is the only party with a clear and consistent position on Brexit – staying in the Single Market and Customs Union. Even if that should be eventually achieved it would still leave Scotland outside the EU and subject to much economic damage in the years following 29th March 2019. We also have a decision to make. Independence offers more continuity going forward. Remaining in the union ties us to a very uncertain future and a considerable loss of potential. Of course we wish England well. Scottish Tories are always keen to stress the importance of cross border trade. They never acknowledge that is a two way process just as the UK’s trade with Ireland has been important to both countries. Independence means a period when Scotland will use sterling. They will have to go on buying from us because the cost of buying from other countries will be more expensive and inflationary. That will give England a bit of a breathing space. When we switch to our own currency that will further impact on the value of sterling. The Scottish pound, as a petro currency, backed by strong exports and inward investment, some of it from England, is likely to appreciate. That will make visiting family and friends in England much cheaper. What’s not to like. Control was never in England’s hands but it is ours to grasp and make Scotland our kind of country – fair, compassionate, more equal and that bit more prosperous. During the American Civil War the dollar plunged. In that period of 4 years £1 sterling bought 10 US Union dollars. Confederate dollars were worthless and not even trusted in the South as the war dragged on. If you have a genuine Confederate dollar note in good condition it will be worth something today but most of those in circulation are fakes, whether printed at the time or given away in the 50s in cereal packets. Like the UK before and even now, the US is looking to restore a past slipping away. ‘Making America great again’ is an acknowledgement that long-term change is in the wind for a country with unsustainable debt.